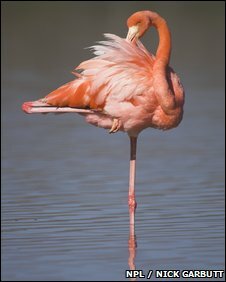 Why flamingoes stand on one leg: "It is one of the simplest, but most enigmatic mysteries of nature: just why do flamingoes like to stand on one leg? The question is asked by zoo visitors and biologists alike, but while numerous theories abound, no-one has yet provided a definitive explanation. Now after conducting an exhaustive study of captive Caribbean flamingoes, two scientists believe they finally have the answer."